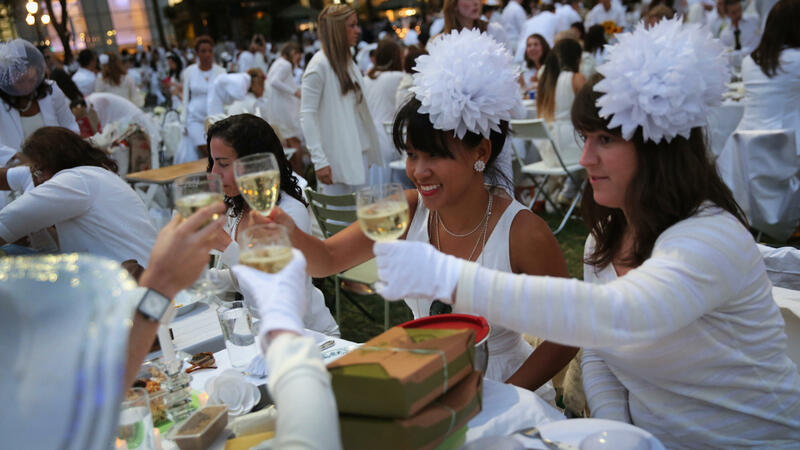 At Diner en Blanc ("Dinner in White"), people arrive dressed all in white. They bring their own food and, fittingly, white wine. 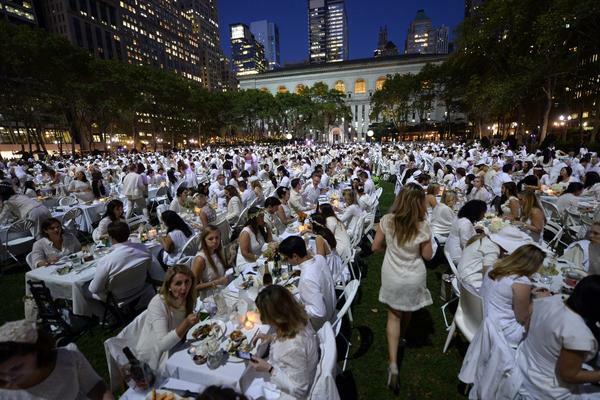 Some 4,000 guests, all dressed in white, showed up for the secret dinner party in New York City's Bryant Park. 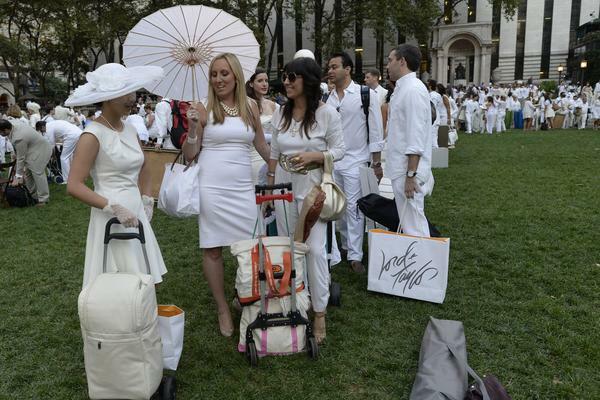 Guests arrive at Bryant Park last Wednesday, toting their dinner and dinnerware with them to the secret pop-up picnic. 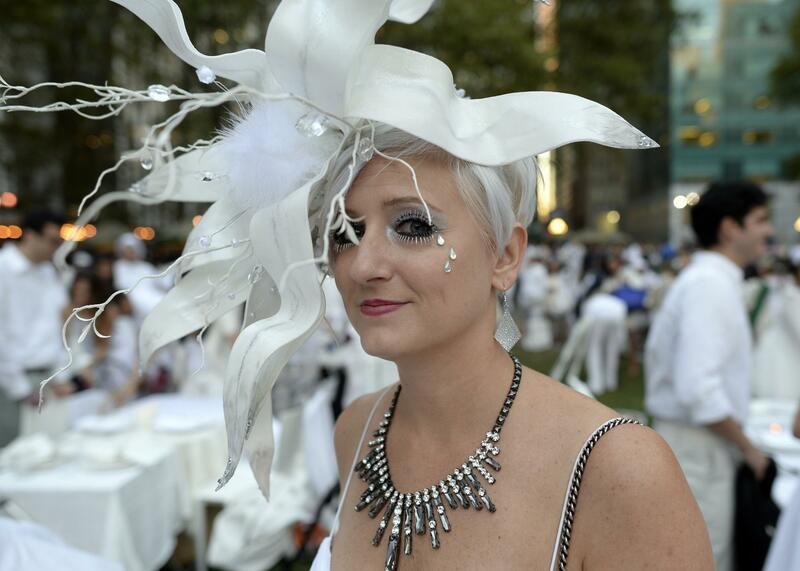 Many guests see Diner en Blanc as an occasion to unleash their fashion whimsy. The event is always held outdoors, always at a landmark location revealed at the last-minute. 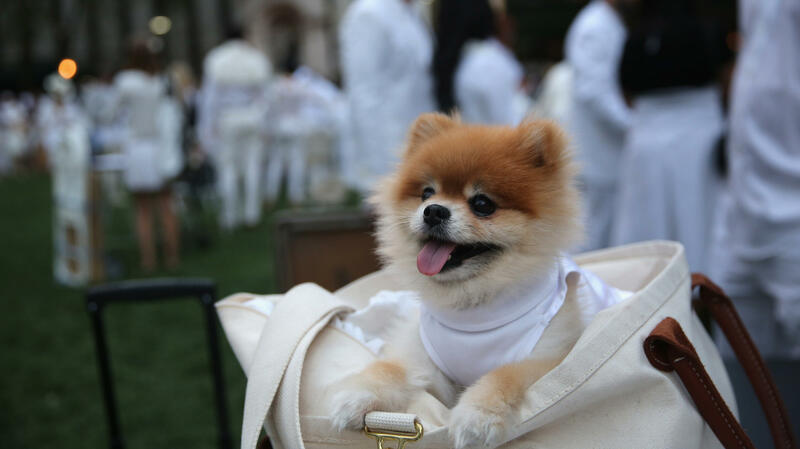 Here, a guest at the Bryant Park event last week. 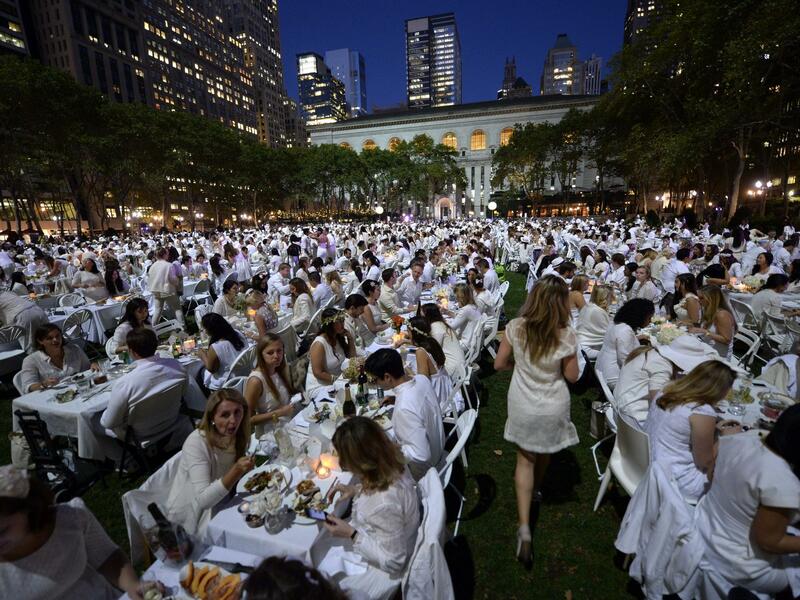 Diner en Blanc began in Paris 25 years ago. This year, Paris hosted the event in the Trocadero gardens, in front of the Eiffel Tower. Even four-legged guests observed the chic, strictly white dress code at Wednesday's event. Thousands gathered for the 2013 Diner en Blanc in New York City this week. This year marks the 25th anniversary of the pop-up dinner event, which began in Paris. 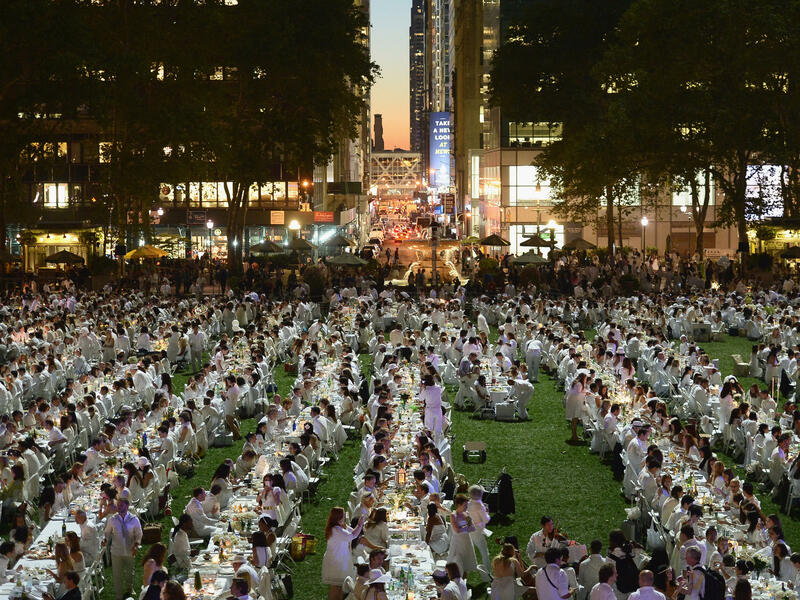 On a gorgeous night, some 4,000 people, dressed all in white, have come to dine in a public, yet secret place in New York's Bryant Park. 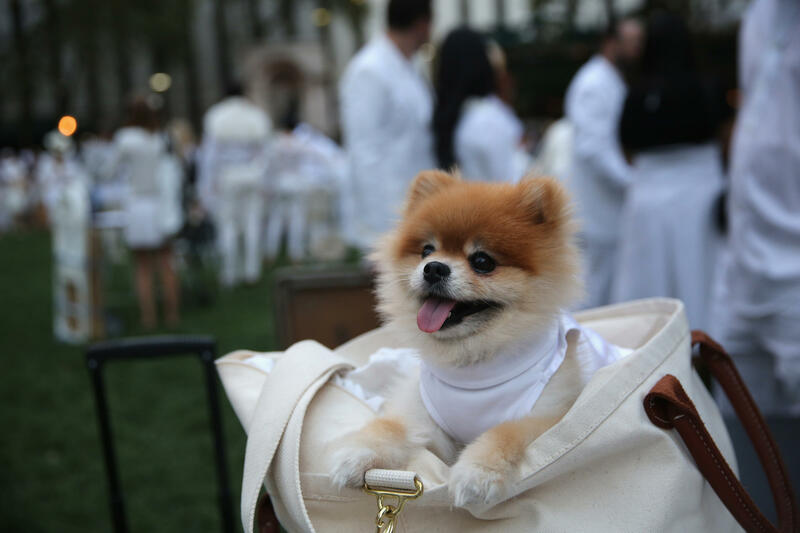 They have come for Diner en Blanc, an unusual pop-up event that takes place in 20 countries. The guests eat in splendor at a location they only learn about minutes before they arrive. The thousands wave white napkins to signal the beginning of the event. They arrived at 6:30 in the evening last Wednesday, carting white tables and chairs, china, food, wine glasses and cutlery. This is the third year that Diner En Blanc has come to New York. Laura Tyring, who has traveled down from White Plains, stands in a line with her friend, Monica Condor, rolling her cart as the queue moves slowly, carrying a big straw basket filled with supplies. She wears a white shirt, white pants and and a big, white, lacy, floppy hat. How long ago did she learn the secret location of this event? "A minute," she says. "They gave us several locations where to meet." Attendees are told to wear comfortable shoes and have a subway card. They meet a team leader who says,"follow me," and they don't learn the location until they are almost there. Fitting more than 1,800 tables into Bryant Park means pushing every table very close together. The chaos of setting up flows into organization and beauty: fine white china; white napkins, sometimes folded into intricate designs, flowers — white lilies and roses; little electric candles that would not blow out in a wind. And, of course, the clothes: wedding dresses, styles from the '20s, people wearing white angel wings. Sandy Jarrett came here with her daughter, Michele. "It's all about the adventure," she says. "It's about lugging all the accoutrements to some unknown destination, and then getting there and seeing all these adventurers in white. It's magical." The co-hosts of this New York event are Sandy Safi and Aymeric Pasquier, who also run the international organization. "It baffles me every time to see how much people invest into this," Safi says. But she says it works because it's spontaneous and different, and it gets back to basic values we forget in the bustle of city life, "sharing a meal with friends, getting dressed up." 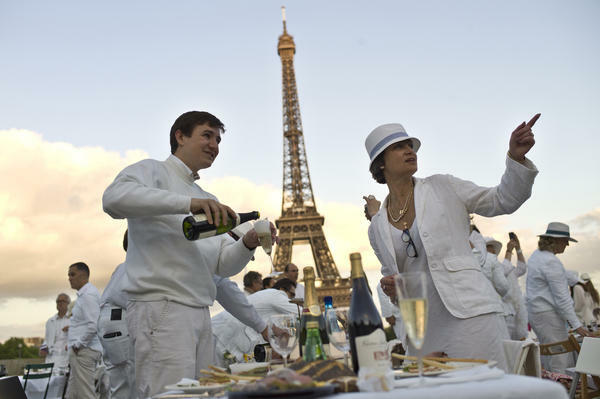 Diner en Blanc started 25 years ago, when Francois Pasquier, Aymeric's father, decided to hold a dinner party in the Bois de Bologne, a large public square in Paris. Since some guests were bringing along friends, he asked everyone to wear white so they would be able to spot each other easily. 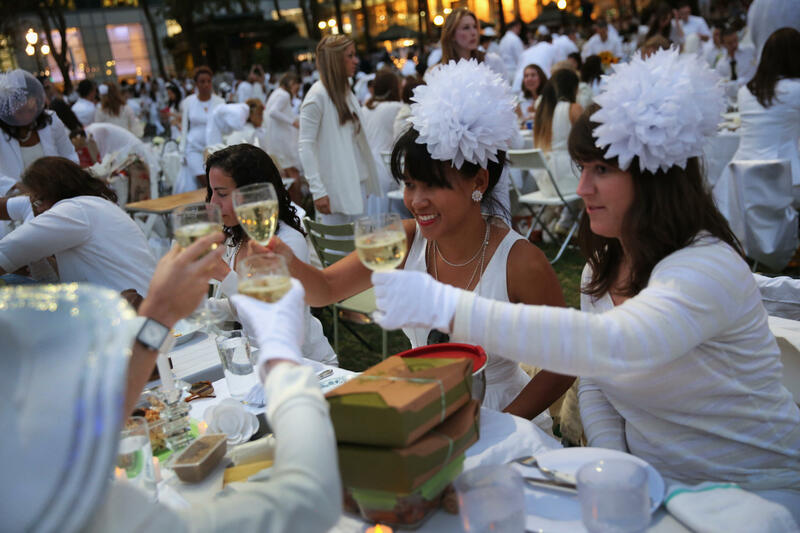 These days, Safi says, Diner en Blanc takes place in 40 cities around the world. But interest exploded after New York hosted its first event three years ago, Safi says: Since then, some 400 cities that have requested Diner en Blanc to come to them. Pasquier says part of the appeal is the effort that's required to participate. "Most of the events now, you just pay a price and you're passive," he says. "In Diner en Blanc, it's [just] the opposite. You work a lot, you have to bring your own table, you have to bring your own chairs, so you commit, and you have to bring back your garbage. All this work is like an achievement, and you will see the joy of people tonight." A few minutes later, I'm walking through the lines of white tables when an acquaintance, Leslie Brown, calls out to me. She is at a table for six, filled with glorious-looking food and several bottles of wine. "What's on the menu," I ask? She tells me: salmon, an assortment of cheeses, roasted cauliflower and peas, a rice salad with portobello mushrooms, skewers of shrimp and, of course, lots of wine and desserts. Then, just as I am about to leave, Brown says, "Are you going to sit down and eat with us? We have an extra plate. We have enough, and I have an extra knife and fork." So I sit down on a very low box — there are no extra chairs — and take a skewer of lovely grilled shrimp and some of that portobello salad and a little of that dish of cauliflower and peas. And I join the conversation. Next year, perhaps, I will have to find a really nice white dress. On a gorgeous night in New York City last week, some 4,000 people dressed all in white dined in a public, yet secret, place. The event is called Diner en Blanc. That's how the French say "dinner in white." It's this unusual pop-up event that takes place in 20 countries. The guests eat this fabulous meal at a location they learn about only minutes before they get there. NPR's Margot Adler reports. 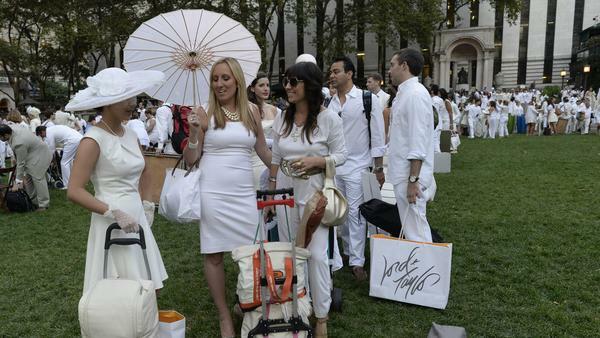 MARGOT ADLER, BYLINE: They arrived in Bryant Park at 6:30, carting tables, chairs, china, food, glasses and cutlery. Laura Tyring came down from White Plains. She stood on line with her friend Monica Condor, rolling her cart and carrying a big, straw basket; wearing a white shirt, white pants and a big, white, lacy, floppy hat. How long ago did she learn the secret location of this event? TYRING: They give us several locations where to meet. MONICA CONDOR: What number are we on - number two? TYRING: Eight. We're on number eight. ADLER: Tyring tells me they met up at a particular location. TYRING: And then the leader tells us: Follow me. ADLER: And they didn't even learn it was Bryant Park until they were almost there. CLAYTON LEHOTAN: Push up - right up - against the table behind you. Next to them - no space. ADLER: That's Clayton Lehotan, one of the table leaders organizing the 4,000 diners in a scene that started with a bit of chaos. But as you watch more than 1,800 tables being set up in this park, suddenly it's organized and gorgeous - white china; white napkins, sometimes folded in intricate designs; flowers - white lilies and roses; little, electric candles that won't blow out in the wind. And the clothes - wedding dresses, styles from the '20s, people wearing white angel wings. Sandy Jarrett is here with her daughter Michele. It's Sandy's second time. SANDY JARRETT: It's all about the adventure. It's about lugging all the accoutrements to some unknown destination, and then getting there and seeing all these adventurers in white. It's magical. ADLER: Sandy Safi is one of the co-hosts of Diner en Blanc. SANDY SAFI: It baffles me every time to see like, how much people invest into this. ADLER: It's been 25 years since it started in Paris. Last year, 13,000 dined in front of the Eiffel Tower. But when it came to New York three years ago, she says, requests started pouring in. SAFI: From all over the world. I can tell you, I have about 400 cities right now, waiting to join the network. ADLER: And there are thousands on the waiting list for the New York event. So what's the magic? I ask. She says it's doing something spontaneous and different that gets back to basic values we forget in the bustle of city life - sharing a meal with friends, getting dressed up. Her co-host, Aymeric Pasquier, is a son of the founder of Diner En Blanc. AYMERIC PASQUIER: Most of the events now, you just pay a price, and you're passive. In Diner En Blanc, it's right the opposite. You work a lot. You have to bring your own table; you have to bring your own chairs. So you commit. And you have to bring back your garbage. All this work is like an achievement, and you will see the joy of people tonight. ADLER: A few minutes later, I'm walking through the lines of tables when surprisingly, an acquaintance - Leslie Brown - calls out to me. She is at a table for six, filled with glorious-looking food and several bottles of wine. What's on the menu? I ask. LESLIE BROWN: An assortment of cheeses that Joy brought along. We have roasted cauliflower and peas, a rice salad with portobello mushrooms that Bernadette made. ADLER: And the list went on. And then came this. BROWN: Are you going to sit down and eat with us? ADLER: Well, I don't know. BROWN: We have an extra plate. We can just make one for you. BROWN: I am serious. Why not? BROWN: Yes, we have enough to fit, and I have an extra knife and fork. ADLER: They found a box for me to sit on, and there was lots of good food and conversation. Next year, perhaps I will have to find a really nice white dress. Margot Adler, NPR News, NY.